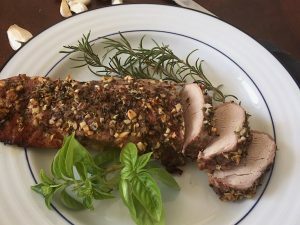 Roasting them gives them a more intense flavor, and lovely crispy bits that even the pickiest eater will enjoy. Roasting veggies is great way to prepare them, as it takes very little effort to prep and cook them, and makes a great change from steamed or boiled vegetables. Grab a bunch of veggies, some oil and an oven-proof pan and get roasting! 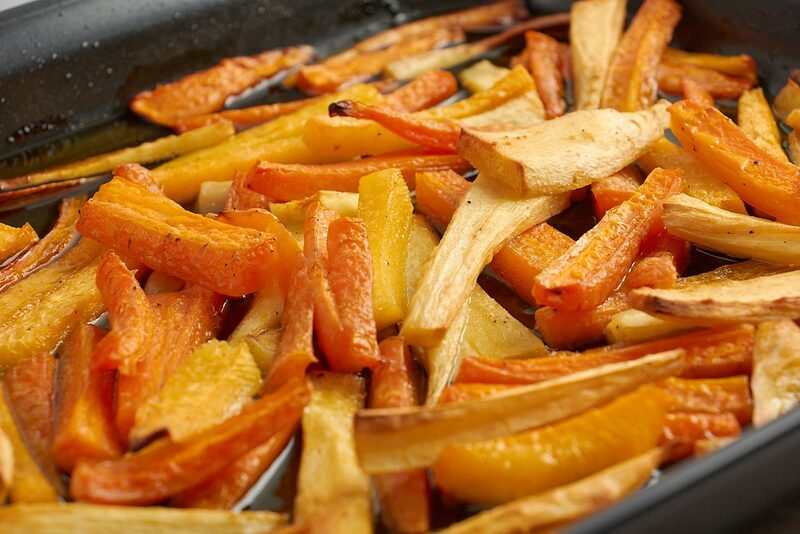 What Vegetables Can You Roast? Root vegetables such as potatoes, parsnips, sweet potatoes, and carrots are old faithful standbys when it comes to roasting, of course, but take a look through your crisper drawer and you’ll find all sorts of potential candidates for roasting – from crucifers like broccoli and Brussels sprouts to surprises like zucchini, onions, bell peppers, and cabbage. Even tomatoes can be roasted to make a change. Preheat your oven to around 425F/200C/gas mark 7. Peel and chop your selected veggies. You can cut them into little bite-sized cubes, or have them in long sticks like chunky fries. 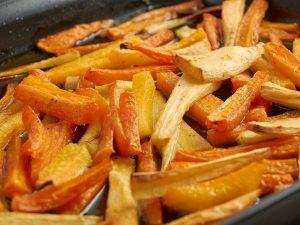 Toss your cut veggies with an oil of your choice – I like to use good-quality olive oil for most veggies, but if I’m roasting potatoes I like to use goose or duck fat instead. Try using avocado oil, coconut oil, or any other oil you want to try. The trick is to get your veggies coated all over with oil without ending up with large puddles of it in the bottom of your roasting pan. Usually a couple of tablespoons is enough to do the job. 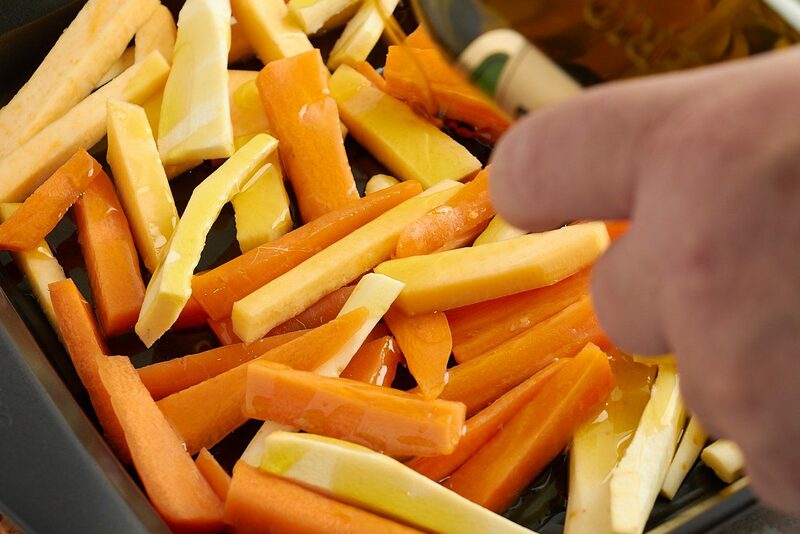 Toss the vegetables around in the oil until they’re glossy and coated. You can do a really good job of this by using your (clean) hands to work the oil around the veg, but tongs or a couple of large spoons will do the job too. 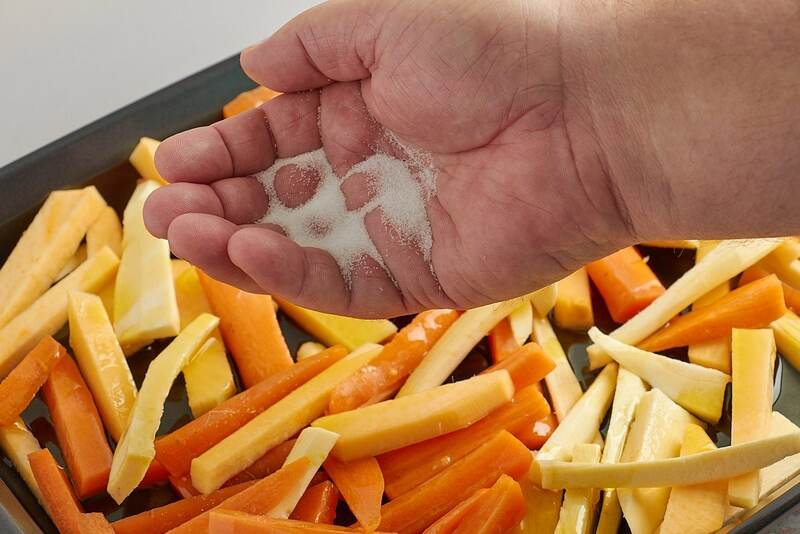 Toss some salt and pepper into the veggies and mix well. Add the veggies to your roasting pan, making sure that they are in a single layer with space between them. It’s tempting to fill the pan, but if the veggies don’t have enough room, they’ll be cooked but soggy, instead of crisp and tasty. Use two roasting pans if you need to. Put them in the oven and leave them alone for around 15 – 20 minutes. At that point, check for tenderness, and toss the veggies in the pan with tongs, so that all parts of them have a chance to crisp up. Smaller pieces will roast quicker than larger ones, and roast potatoes usually need around 40-50 minutes for larger pieces to roast. Keep roasting until you see toasted, crispy bits on the edges of the veggies. It’s this charring that adds to the taste, so keep roasting until your veggies start to turn brown at the edges. Once done to your liking, remove from the oven and serve while hot. 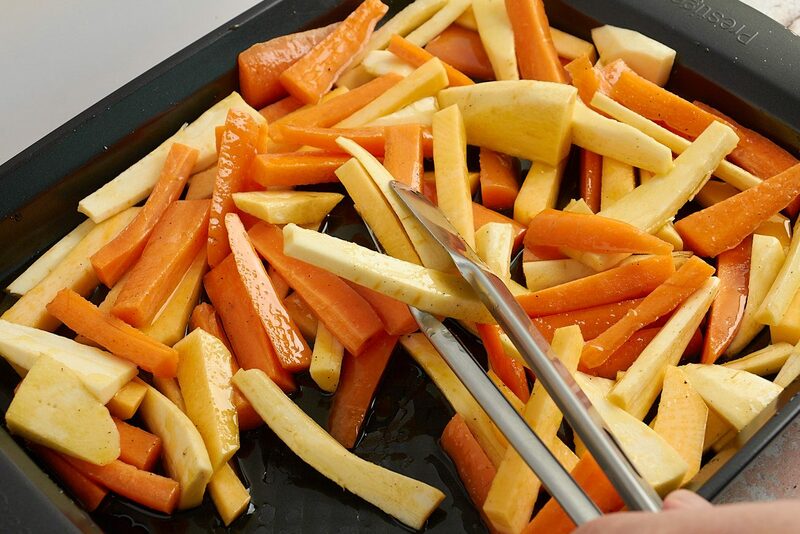 For vegetables with different cooking times, such as potatoes and carrots, roast the different veggies on separate trays and combine them after cooking. This means you can check on how each veg is doing and remove them once they’re done to keep warm until the other veg are ready. Pair veggies with the same cooking times on the same baking pan. 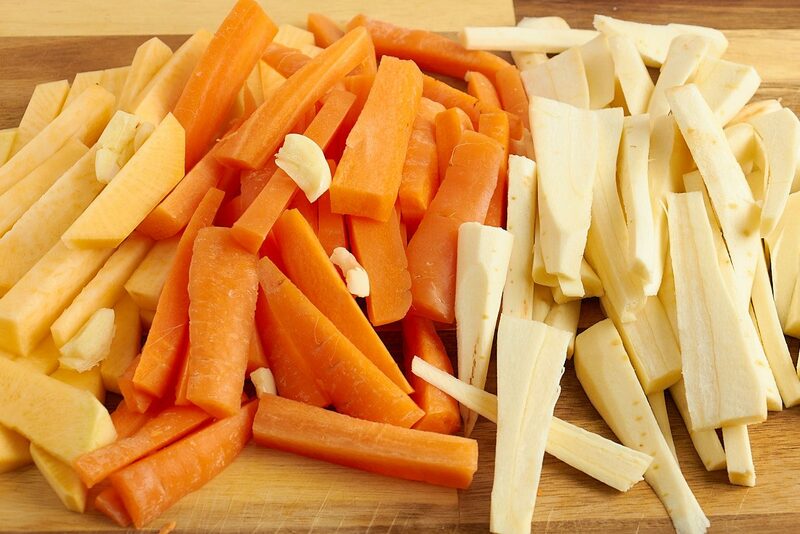 Carrots and parsnips, cauliflower and broccoli and butternut squash and potatoes take roughly the same time to cook. Roast in stages. Add different veggies to the baking pan in stages, according to how long each one takes to cook. If the pan starts to get too crowded, split them between two pans.